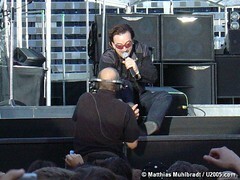 ‘My shoes hurt,’ Bono sang during I will follow in Berlin on Thursday evening, apparently grown too big for his boots. Luckily A.J. had a pair of B’s special creepers on stand by. (Pictures by Matthias Mühlbradt.) Later on, A.J. had a little more trouble trying make Bono understand his fly was unzipped. Not to worry, only 80,000 people watching. Actually, if you’ve ever seen “Mr. Show”, “My shoes hurt” means “I love you”. Isn’t that better? please post link of said shoe removal.